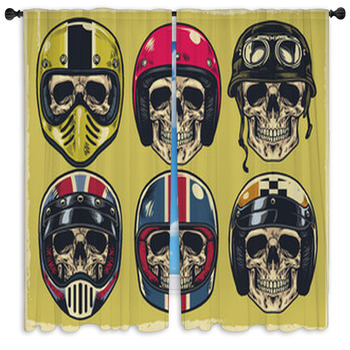 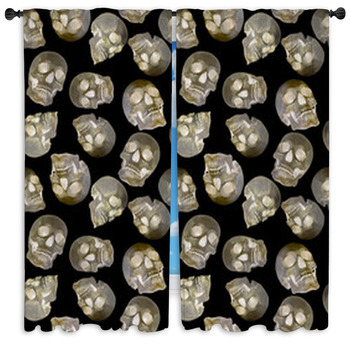 From punk rock logos to runway fashion, from skateboarding culture to heavy metal t-shirts, skulls are hot these days, and now you can even have skull window curtains and drapes. 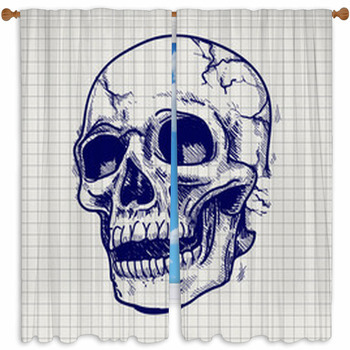 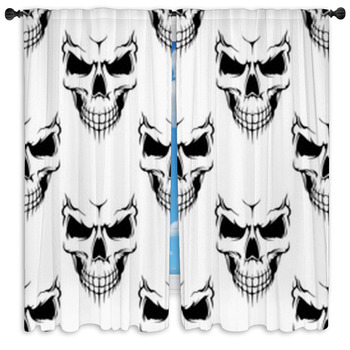 How intense of a skull can you handle looking at on your new floor-o-ceiling custom size window curtains? 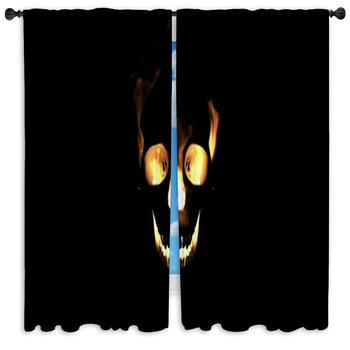 Do you want a grinning skull surrounded by splatters of blood, a skull immersed in fire with crossbones made from steel wrenches, a one-eyed skull missing the bottom of its jaw and flying with bat wings, a crystal skull with glowing yellow eyes, a smiling, voodoo style finely illustrated skull, or a green punk tattoo style skull chomping on a cigar and wearing a bowler hat? 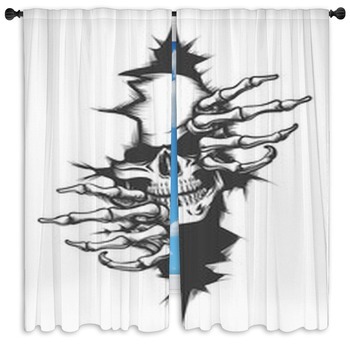 How about a Jolly Roger eye-patched pirate flag displayed on your curtains, or a skull floating over a cemetery with the silhouettes of tombstones, leafless trees, and a metal fence beneath a crescent moon and bats flying in a red sky? 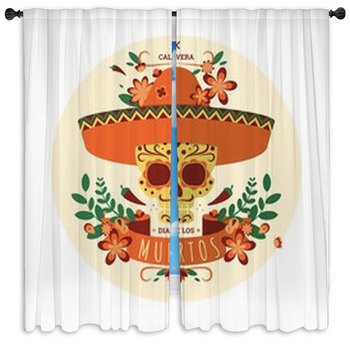 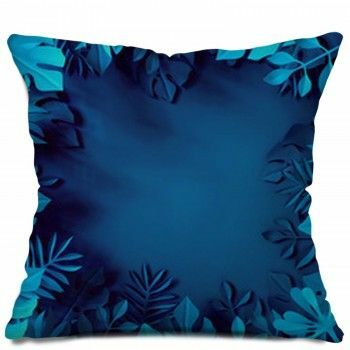 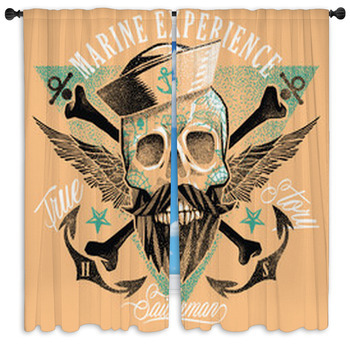 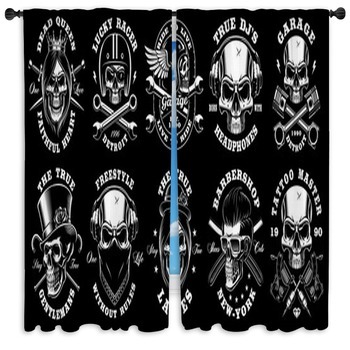 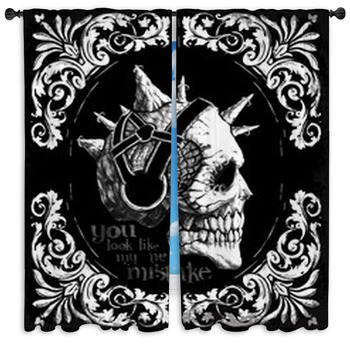 If you prefer a funnier, more lighthearted skull design for your window curtains, choose a hot pink skull and crossbones on black, a skull wearing a pink ribbon on its head, an illustrated girl in a skull tank top in front of a purple skull pattern background, or a pirate cat wearing an eye patch and skull bandana. 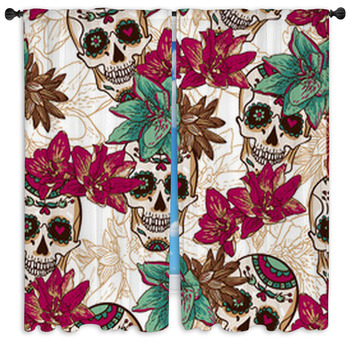 For more ornate skull curtain designs, check out our image of a skull with roses for eyes, stems, leaves and jewels drawn on his forehead, and three roses place around his head, a skull with bird wings, smears of red and black paint around his jaw, and two black Xs below it, or a skull set atop a bundle of flowers, vines and leaves holding a banner in his mouth, which you can add the name of your boyfriend or girlfriend to, when you give them a set of skull window curtains.